Speaking to The Guardian newspaper nearly ten years ago about the concept of creativity and the music of Hawkwind, Dave Brock said “I mean, we can’t play the same old stuff the same every time.” And the man who jointly founded the band way back in 1969 and is its last remaining original member has certainly remained true to his word. Whether at that time he had envisaged that come 2018 the legendary space-rock pioneers would be embarking upon their most ambitious project yet – joining forces with a full orchestra for a series of live dates – may well be open to question. But what is not in doubt is the fact that for almost half a century now, the intergalactic trailblazers have sat in the vanguard of sonic exploration and artistic evolution. They are, after all, a band who have known more than 40 different line-ups in their long and winding history and have previously appeared in concert as their very own support act. Hawkwind are in Leeds Town Hall tonight on the second of what is a seven date tour of England, one that will include two already sold-out shows at London Palladium. That they have chosen to appear here in the magnificent surroundings of a Grade I listed building that dates from the mid-nineteenth century seems entirely apposite given that Hawkwind and the town hall are both venerable institutions each one steeped in their own individual grandeur and unique story of survival. For Hawkwind’s part they have embraced, and ultimately outlived late 60’s psychedelia, intense LSD ingestion, the peace convoys, free festival movements and solstice gatherings of that period, punk, electro-ecstasy, techno and most all points between. 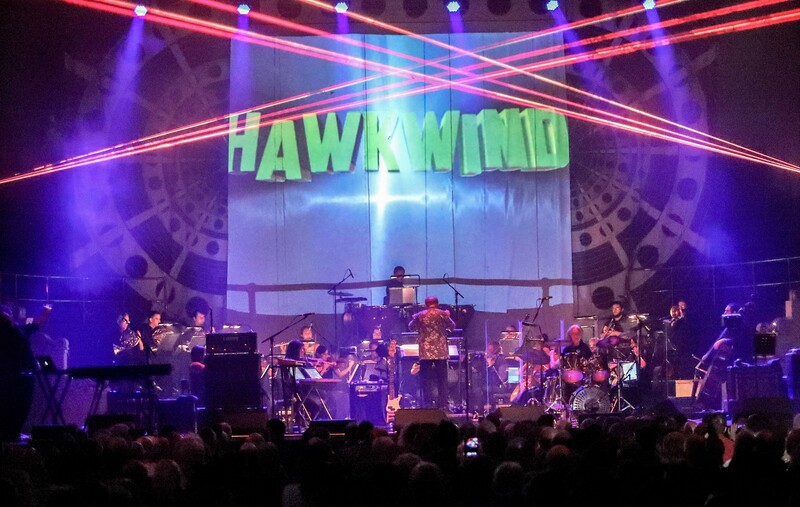 Given this fascinating journey, it should then perhaps come as little surprise that Hawkwind are now performing with a live orchestra or that the orchestral score for these shows will be produced by Mike Batt, the man responsible for creating the British novelty pop group The Wombles in the mid-70s. The set itself comprises 15 songs in total – nine with the full orchestra and the remaining six seeing the four-piece band performing alone – stopping off at various points on Hawkwind’s extensive recording career from 1971’s In Search of Space (here represented by a stunning ‘We Took The Wrong Step Years Ago’ for which Dave Brock dons his reading glasses to recall some of the lyrics, emphasising not only the passage of time but also the ageing process) to this year’s Road To Utopia (no less than the band’s 31st studio album and from which we get ‘Intro The Night’). When the band and orchestra do combine it makes for a most euphoric fusion of hard driving rock and sumptuous symphonic sound, no more so than on ‘Zarozinia’ which assumes a beautiful cosmic pastoral quality all of its own. A stunning laser lightshow and an avalanche of futuristic images projected onto the backdrop add to the audio and visual explosion. Six songs in and enter another rock’n’roll survivor. Arthur Brown, the self-proclaimed God of Hellfire, may now be 76 years old but age has not withered any of his flamboyant presence. Dressed in a black cloak, matching feathered-hat and carrying a long staff he recites Michael Moorcock’s words to ‘The Black Corridor’. “Space is infinite, it’s dark. Space is neutral, it’s cold” he intones, as his deep theatrical voice resonates around the town hall. Several costume changes later, he departs the stage in his sparkling silver cape at the point whereby Hawkwind, Mike Batt and the full orchestra finally arrive at Utopia. It is now, incredibly, 30 years since Robert Calvert passed away. One of many Hawkwind alumni who are no longer with us, the band’s erstwhile poet and performer’s words live on. The first encore of ‘Spirit of the Age’ is dedicated to him and the four current members provide him with a fitting tribute as they tear through the song at full-throttle speed. And the third and final encore is, of course, ‘Silver Machine’, the band’s one and only hit single. But Hawkwind were never about commercial success. They were always on an endless search for space whilst playing some incredible freak-out music along their way.